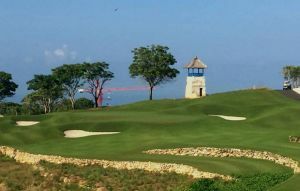 Asian Golf Monthly went even further, proclaiming it the best golf resort in the whole of Asia, so golfing connoisseurs should ensure that a round here is part of their Bali golf holiday. 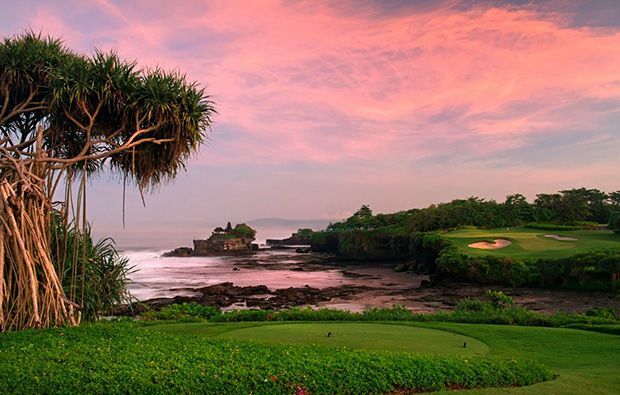 The lush Balinese landscape, terraced rice fields and stunning ocean views have make this one of the most photographed courses on earth, but this is far more than just a sightseeing trip. 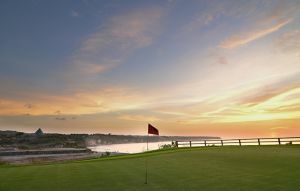 Tee shots over deep ravines (the 13th), frustratingly well-placed fairway bunkers (almost every hole) and, on a stunning three hole stretch that runs along the cliffs, bracing winds ensure that this course is a challenge worthy of the pros. This course really is a treat, featuring three cliff-to-cliff tee shots and five ocean-side holes. From the moment you drive off over the working rice paddies on the 383-yards par-4, you realize you are in for something special. 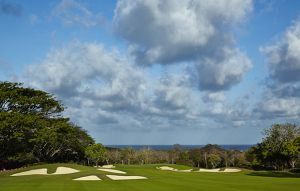 By the time you’ve played the second, you’ll know you are in for a real challenge, a tropical stream running down the entire left hand side of a fairway that cruelly slopes towards the water. 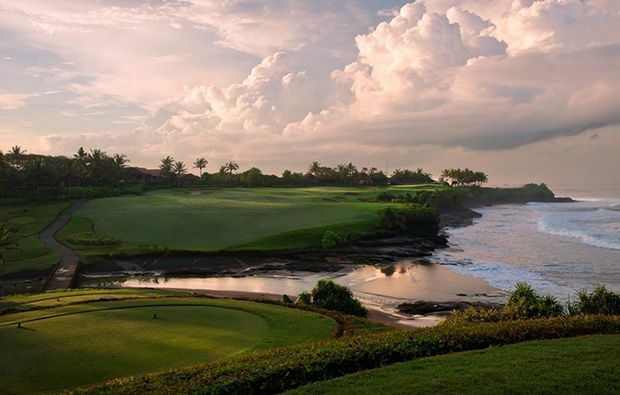 The signature par-3 7th is the most memorable, its cliff top location and views of the famous Tanah Lot temple ensuring it is the most photographed hole on the course. The wind can make the drive particularly perilous, but if you are lucky you can gauge its direction from the clouds of orange incense being burned by the devout as they wade out to the temple to pay their respects. We won’t go into detail on every hole and spoil the surprise, but an honourable mention should go to the 18th, a 520-yard par-5 that tempts the big hitter to go for broke. It’s a fitting end to a memorable experience. Catch the right bit of fairway and the downslope can put you a position to consider trying to traverse the creek and reach the typically lightning quick green in two. We’d advise against it though – it’s a much better idea to lay up to the left and try to get up and down for what would be an impressive birdie. The Balinese-style clubhouse offers great views of the 1st, 5th and 9th holds from a large open-air terrace, a great place to enjoy a post-round drink or meal. There are spacious and luxurious locker rooms, a fully stocked pro shop and a range of culinary options. 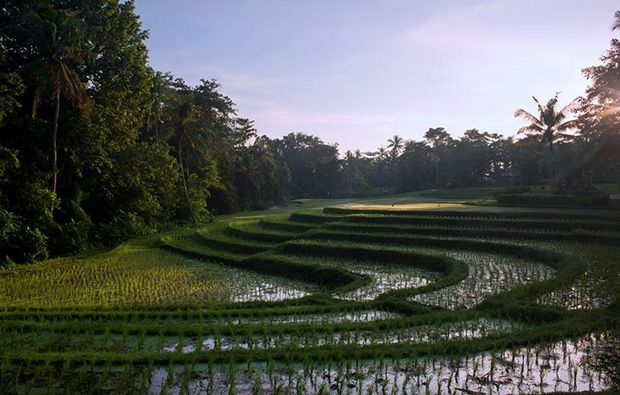 However, it’s the course that makes a visit worth the effort, and the Nirwana Bali Golf Club more than lives up to its reputation as one of the most memorable golfing experiences in Asia. You have to play this course and if you would like to book a tee time then the Golfsavers booking engine makes things very easy and displays all the available green fees. 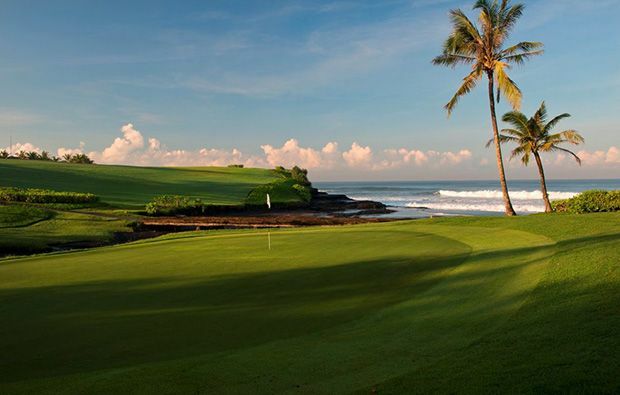 Booking a tee time at Nirwana Bali Golf Club has never been easier. With the Pan Pacific hotel onsite this is also a great place to stay on a Bali golf holiday and if you stay here you get special resident rates on the course. 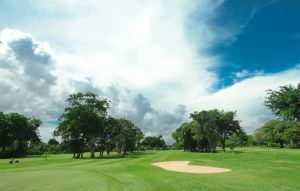 Nirwana Bali Golf Club has different Services to offer. Choose a date and number or players to see the rates.